Auto-Chaotic. Transformers: Age of Extinction, Reviewed. Age of Extinction is the best of the Transformers movies. That's not saying much: The other films in the series were all pretty bad, and this one is no good, either. But for an hour or so, director Michael Bay does what he does as well as he's done it for quite some time. Perpetually juvenile he may be, but god bless him, he can still string together a kinetic sequence and make everything look like the most luscious TV ad ever. Depending on the moment, this fourth installment can resemble a music video, a beer commercial, or a military-recruitment spot. No one on the planet makes movies like Bay can, and you have to tip your cap: His whiplash, slow-motion, over-amped epic style is all his own, influenced by no one and still pretty potent when he's properly inspired. But what does it matter when so much of Age of Extinction is numbingly dumb and cheesy, one decent hour crushed by almost two other hours that aren't even close to respectable? If you can't remember a lot of what happened in the three previous Transformers films, you're in luck: Most of what came before doesn't matter. (Even then, though, while watching Age of Extinction, you may get an uncomfortable sense of déjà vu: Good god, why is Optimus Prime always such a drip in these movies?) Set five years after 2011's Dark of the Moon, this one finds the people of Earth still reeling from the titanic battle of Chicago that wiped out most of the city and convinced humanity that Transformers weren't worth the trouble. Even the heroic Autobots (including Prime, voiced by Peter Cullen since the old animated series) must go into hiding, fearful of being hunted down by a hawkish CIA muckety-muck (Kelsey Grammer) and a ruthless bounty-hunter robot named Lockdown (voiced by Mark Ryan). Another reason why you don't have to be up on Transformers is that all the previous human characters are out of the picture. Instead of Shia LaBeouf's whiny Sam, we have a hero with the Mad Magazine-sounding name of Cade Yeager (Mark Wahlberg). A Texas inventor badly behind on his house payments, he's a widowed father doing his best to raise his teen daughter Tessa (Nicola Peltz, pretty, forgettable), who's growing up too fast for him and secretly dating Shane (Jack Reynor, pretty, forgettable). Discovering that Optimus is camped out on his property, Cade is soon swept up in the government's relentless pursuit of all Transformers, forcing them all to go on the run. What has never sat right about Bay's Transformers movies is that, for anyone who actually enjoyed the 1980s series, the focus has always been on the wrong characters. The humans on the animated program were never interesting: It was the iconic, very simplistic depiction of good (in the form of Optimus Prime) and evil (Megatron) that played out between robots that could transform into things like cars, planes, guns and other cool stuff. As god-awful as 1986's animated Transformers: The Movie was—Orson Welles! Judd Nelson!—even that film understood what made the concept special. Whereas for all the explosions and action of Bay's films, they've always felt like a slog because the Transformers were supporting characters in their own damn franchise. And as underdeveloped a protagonist as Sam was, at least he got to have a personality. Optimus Prime just spouts drab platitudes about honor and sacrifice like he's the world tallest, most deadly presidential hopeful. Age of Extinction doesn't do much to correct this problem, but since the focus is still on the humans, at least they have a better one in the lead. In his Disturbia years, LaBeouf could play a charmingly insecure teen convincingly, but by the time of the Transformers series, it had calcified into a smarmy schtick. (To be fair, nobody ever comes off well in these ear-rattling monstrosities.) But Wahlberg is an upgrade: He has just the right amount of physicality, charisma, and sincerity to sell Cade as a beleaguered father trying to protect his little girl. (And as he's shown in The Other Guys and I Heart Huckabees, he's got a gift for wringing laughs out of his characters' slightly manic exasperation.) And if you're going to spend a second resisting the conceit that Cade is a frustrated-genius inventor—Wahlberg wears glasses sometimes, to show he's smart—then you'll never get over the dozens of other ludicrous implausibilities contained in this movie's 165-minute running time. As Bay gets older, though, his films' ludicrousness gets more and more charming. Every low-angle hero shot, every ridiculously overblown slow-motion sequence, every lingering camera move that ogles a car or a beautiful woman: He's either repugnant or shameless at every turn, but he's so steadfast in his Peter Pan-like frat-boy demeanor that I chuckled a few times despite myself. He's a schmuck, but he's our schmuck, incorrigible to the last. And for a while in Age of Extinction, he makes his chronic Bay-ness work for him. Wahlberg and Bay, as they showed in last year's Pain & Gain, have the same sort of sweetly innocent meat-head earnestness . Cade's rapport with Tessa and Shane (and Cade's stoner-surfer bud, played by T.J. Miller) is never more than grade-school dumb. (Ehren Kruger's screenplay takes turns having the characters say exactly what's on their mind and engage in dopey "comedic" riffs.) But when Bay's visuals are doing their job—draping each scene in high-octane excitement or power-ballad sentimentality—there's a gut-level thrill that's entrancing. The problem isn't that Bay isn't a good filmmaker: It's that, aside from something like The Rock or Pain & Gain, he rarely transcends or embraces his excesses long enough to deliver the goods on a consistent basis. He doesn't here, either. Age of Extinction's early stretches are plenty enjoyable—the film peaks early with an action sequence in middle-of-nowhere Texas that feels like Bay's first stab at a Western—but quickly goes downhill. And by that I mean, stuff like storytelling and characters start to become important, and Bay is hopelessly out to sea. For as long as the Transformers movies are—613 minutes for the four films—they always feel rushed and nonsensical, incredibly busy with plot points I don't understand. In some ways, the past Transformers films have beaten me down to such a degree that Age of Extinction was the point where Stockholm Syndrome took hold. Maybe I'm becoming inured to their level of crappiness that, by comparison, this one didn't seem that egregiously terrible. Like politicians, ugly buildings, and whores, Bay has gained a certain amount of respectability as he's gotten older. I've come to value his unique ability to produce action movies, and I don't mean that sarcastically: We can carp about his misogyny and visual gimmicks, but the purity of his vision can be engrossing, even stunning. 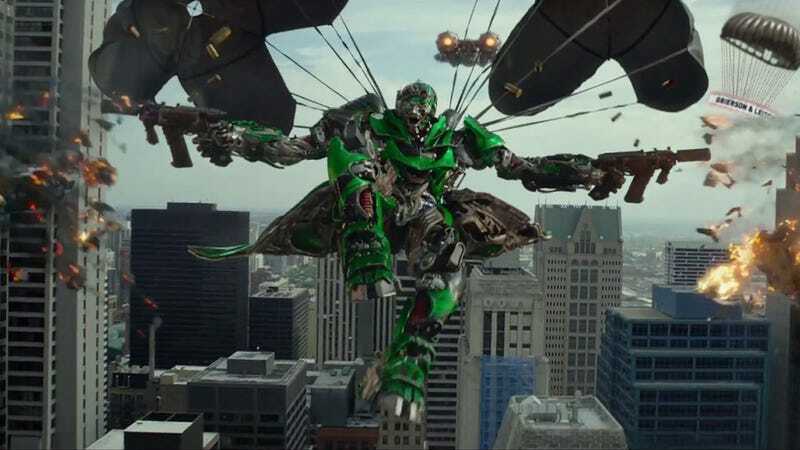 There's one shot in Age of Extinction that made me just about shiver with little-kid joy: For better or worse, he is the modern summer blockbuster. But where his earlier movies were bratty fun, the Transformers movies are, ultimately, ultra-glum. Each sequel is direr than the last, the fate of the planet always, always hanging in the balance. Bay existed before the current era of dark reboots, and on some biological level he's never going to be able to mimic the dour, grownup tone of a Christopher Nolan. He doesn't need to: All we really want from a Transformers movie is some escapist pleasure and a little time hanging out with those big, cool robots. Age of Extinction, like the films that came before it, stubbornly refuses to focus on either of those things.